Having seen at least 6 Beatles tribute bands over the course of 17+ years, my expectations weren't huge. The tribute band phenomenon is a curious oddity, perhaps pointing to the lack of truly good original bands in today's music scene. Although I'm sure that the Beatles lead in the number of tribute bands by sheer number, there are also tribute bands for: the Doors, Led Zeppelin, the Beach Boys, the Rolling Stones and even Oasis. And, imitation IS the sincerest form of flattery, right? But, when you cover the Beatles, the single most popular AND influential group on the planet, you'd better get it right! Especially with so many Beatle fanatics (myself included) ready to pounce on ANY discrepancy, you've gotta really "mach shau" (to use a term familiar to those of us in eternal Pepperland). you will twice be entertained by them..."
For the next hour and a half, the Fab Four entertained with note-perfect renditions of Beatle classics. This all performed by the group without any tapes, sequences or backing tracks! Since the music performance was beyond any criticism, I will concentrate on the often stunning visuals of the Fab Four's show, including three costume changes representing every era of The Beatle’s ever-changing career. The Fab Four opened with "I Want To Hold Your Hand", wearing those classic 1964 Beatle stage suits. 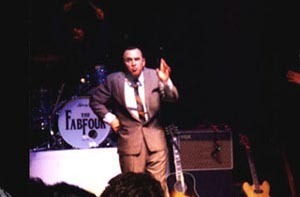 (For historical accuracy, this was not the first song performed by the real fabs on Sullivan in 1964 - "All My Loving" was. But, the Fab Four did point this out later.) The first thing that struck me was the uncanny mannerisms of the group, especially "John" & "Paul". These two displayed every little nuance of the originals, from their stance, John's "cripple" routine and Paul's often-cheesy interactions with the audience. And of course those familiar accents – they had them down pat! Although "John" & "Paul" were the true standouts, you could often see "George" doing his little "shuffle-jig" (which the original Harrison did during the first tour of the Beatles). "Ringo" only had the spotlight once, during "With A Little Help From My Friends", but he did a more than adequate job of portraying Mr. Starr. I believe this is what makes the Fab Four rise above ALL other Beatles tribute bands - not only are they exceptional musicians, but great ACTORS at the part as well. My wife's background in theater has given me a slightly different perspective on the portrayals of the Beatles. A few years back, my wife directed (and wrote) "Unfinished Music: the Life of John Lennon". In this play a man of Vietnamese background portrayed George Harrison! The sign of a good actor is when the audience believes the part, despite whatever he looks like. For example, after the VH1 movie "Two of Us" came out (which I thoroughly enjoyed! ), I was baffled by the number of message boards with negative comments about the actors. "They didn't look anything like them", was the common complaint. By concentrating on the aesthetics, they overlooked the ACTING. Pure tunnel vision. Many times during the Fab Four's performance, I felt a sense of deja vu, it was truly uncanny. And it didn't take long for a throng of girls to appear all along the stage, dancing for the rest of the performance. During their "1964" set, the FF also played, "A Hard Day's Night", "All My Loving", "I Should Have Known Better" and "Can't Buy Me Love". Before "All My Loving", Paul set the record straight saying, "this is actually the first song we played on Ed Sullivan." Thus began a short, pun filled dialogue between John and Paul about "Ed", ending with Paul saying "of course" (a take-off of the 'Mr. Ed' theme, with its "horse is a horse of course" line). What makes their ad lib’s more amazing is that they AREN'T scripted! (we discussed this in our interview prior to the show). The lights went out, and the "James Bond" instrumental intro to "Help" began. This short break gave the group a chance to change into black shirts, representing the 1965-66 touring outfit. The group continued with "Help", "I Saw Her Standing There" and "Twist & Shout". At one point, Ed Sullivan appeared from behind the curtains, shaking his head and pointing at his watch to Ringo. I know that "Ed's" appearance was probably only for the Vegas audience, but it really added to the show. The lights dimmed again, and Paul emerged, singing "Yesterday" on acoustic guitar, striking the same pose as McCartney's rendition of the song on Sullivan's show in 1965. A nice touch was a movie screen above the stage, which had a black & white simulcast, again giving you the feeling of the Sullivan show. (I couldn't help but chuckle to myself with the thoughts of "John" playing the strings on keyboards backstage in his underwear - again, see our interview!). There was then a short video to enable the band to change into their next costumes..."The Sprout of a New Generation". It featured 1966 black & white newsreel footage of an interview with a young, obese fan that had an oil painting that she wanted to give Paul. And her crass accent had the audience all in giggles. No wonder the real fabs got so good at running from their fans! Now, the moment alot of us had been waiting for...the FF appearing in complete Sgt. Pepper regalia to sing, "Sgt. Pepper's Lonely Hearts Club Band", "With a Little Help From My Friends", "Penny Lane", Strawberry Fields Forever" and "A Day In the Life"! The songs were all note-perfect, and at one time John reminded the audience that the band performs without any tapes, sequences or backing tracks. "Ringo" made the only discernable flub on vocals the whole night, getting some of the words turned around on "With A Little Help From My Friends". During "Sgt. Pepper", an authentic hippie in the audience started singing-only it was the WRONG song (one of the San Francisco band songs of 1967-I forget which one)! John quickly barked in that trademark Lennon attack, "wrong song!" (note: This hippie would offer much amusement as the show progressed and "John" made his next change into the 1968, long hair John.) And about those Pepper uniforms? 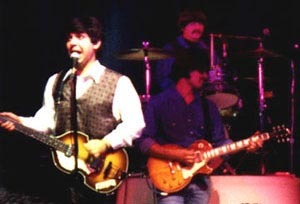 In 1991 I saw a Beatles Tribute band which had cheap, fake looking Sgt. Pepper uniforms. But, not these...the Fab Four's suits were PERFECT re-creations of the satin uniforms! It really helps the illusion to have authentic looking gear, whether it is the outfits or the guitars. Right: Those FAB Sgt. Pepper outfits! Speaking of authentic, one trivial fact I noticed while I was interviewing "John" & "Paul" backstage prior to the show..."John" was putting on contact lenses. During the show, when the 1967 John appeared wearing those trademark granny glasses, I realized what made him look so authentic. Those were REAL glasses, he must have traded his contacts for real glasses during the costume change. You might not think this is a big deal, but it does go a long way to complete the illusion of John Lennon. I mean, you can usually spot those "fake" granny glasses a mile away. At this point John left the stage, leaving Paul, George and Ringo continued with "Got to Get You Into My Life". During the Beatles post-1966 songs, "George" emerged as the great musician of the band, covering most of the keyboards/sound effects on the psychedelic songs. 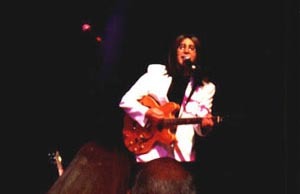 John re-entered the stage, donning his trademark 1968 look: shoulder length hair, white suit and natural finish Gibson guitar just in time to play the last few chords on guitar. Now, I know that "Got to Get You Into My Life" is NOT a Pepper-era song, but somehow its fits. It makes you wonder, "just what IF the Beatles had toured in 1967"? Next was again a short film to entertain the audience while the Fab Four made the next costume change to the "later Beatles". An excerpt from 1973's James Paul McCartney TV show, the film showed the average "man on the street" in England singing various Beatles tunes. After the film John, already in costume, came out to play a rendition of the classic Lennon tune, "Imagine", explaining that its "not really a Beatles song" but that it fits. Again, you got a "what if" as the remaining band members returned to accompany John - seeing the Beatles play "Imagine"! That's what's so special about the Fab Four. They spend such meticulous attention to detail that they can get away with "bending tradition" in other areas. 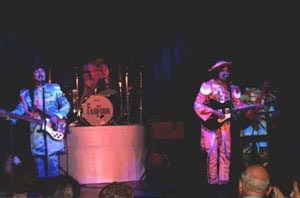 The band, now fully attired in their post-1967 costumes (Paul in white shirt & vest; George in denim) performed the Beatles later-period tunes. Following "Get Back", came one of the highlights for me: "Here Comes the Sun". It was very cool and surreal to see this song played live by "the Beatles", especially ANY song off Abbey Road, which the Beatles never performed live. "Revolution" was played next and our "resident hippie" forced himself up front and center to sing and dance! He had long hair, beard and mustache...the only thing missing was a tie-dyed shirt (he wore a sleeveless Lakers shirt)! For most of the show the hippie had been content to sit in the back and occasionally offer a "friendly heckle". I half expected John to make a crack about "those in the cheaper seats". Paul announced that their next song would be their last and I told my sister (who was at the show), "its GOTTA be 'Hey Jude', their only song that can follow 'Revolution'". Introductions were made of each band member, with Beatles solo song "intro's" to each. For example, "Ringo" was introduced with a few bars of "It Don't Come Easy"; "George" with "What is Life", "Paul" with "Silly Love Songs". Finally, the moment of truth as "Hey Jude" began. (note: the instrumentation was a little inaccurate, as John played the Hofner bass and George played the acoustic- the 1968 video shows John playing his natural finish Gibson and George playing, I believe, a Fender Mustang). As the song ended, Ed Sullivan again appeared, wearing a Beatles wig! And during the chorus, the moveable wall between the theater and the casino was removed to expose the whole casino the Fab Four’s majestic “Hey Jude”!